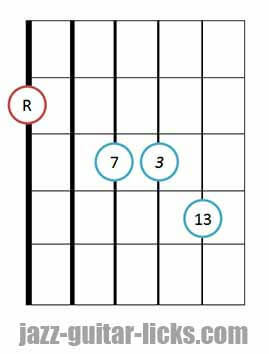 What Are Major 13 Chords? The first thing to understand is that a major 13th chord is built based on a major tetrad chord (aka maj7). The basic formula that is root (1), third (3), fifth (5) and seventh (7) is theoretically extended with the 9, 11 and 13. 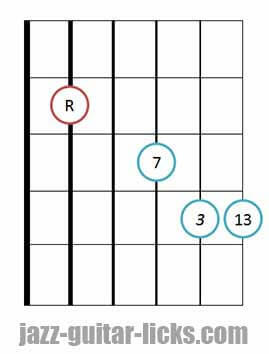 Major 13 chord can also be seen as a major 9th chord with two supplementary notes (11 & 13) or a major 11 chord with a 13th added. The basic formula is root (1), third (3), fifth (5) and seventh (7). The notes in yellow in the chart below can be added to the basic structure of a major 7th chord. However, the 11th should be used with caution indeed, the 11th (witch is the fourth) clashes with the major 3rd. Here are the main guitar shapes to play major 13 guitar chords on the guitar respecting to the major scale. Theoretically major thirteenth chords contain seven tones : root (1), major third (3), perfect fifth (5), major seventh (7), ninth (9), eleventh (11) and thirteenth (13). Since there are only six strings on the guitar, it is physically impossible to play all these tones. Notes like 3rd, 7th and 13th are the most important, these are sufficient to highlight the color of the chord. In other words, it means that 9ths and 11ths can be left out and the 5th is not necessary. Because the 6th is the 13th, it is important not to confuse major 13 and major 6 chords. Major 6 chords do not contain any 7th. It's only 1,3 5 and 6 (13). 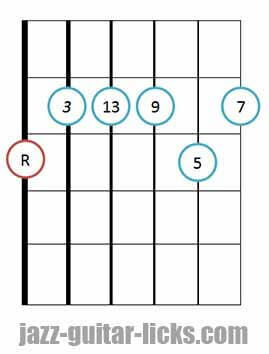 Check out the page about major 6 chords. 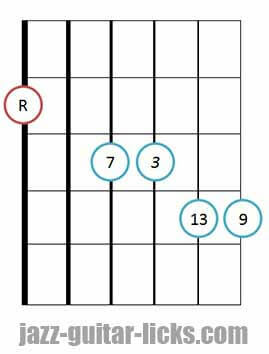 Major 13th guitar chord shape - Bass on 6th string - 5th, 9th and 11th are left out. 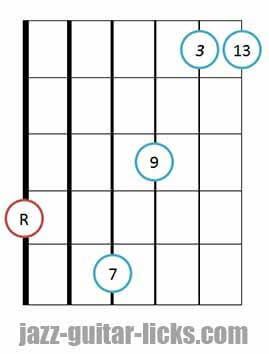 Major 13th guitar chord shape - Bass on 6th string - 5th and 9th are included.5th is left out. Major 13th guitar chord shape - Bass on 6th string - 5th is left out. Major 13th guitar chord shape - Bass on th string - 5th is left out. 5th, 9th and 11th are left out.